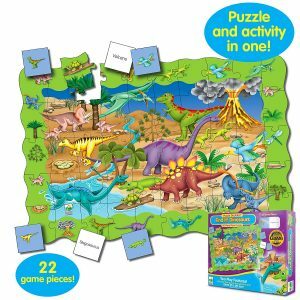 Board Games for Preschoolers - games 3, 4 and 5 year olds love that are fun for all! 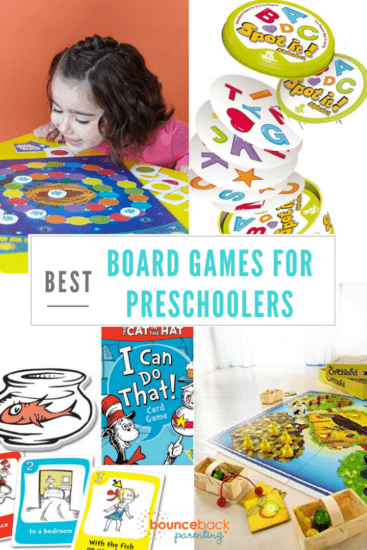 The board games for preschoolers we’ve listed here include our family favorites as well as the top games for preschoolers recommended by parents. The best thing is that we’ve chosen games that everyone likes to play, including parents. They’re fun, fairly quick to play and help develop dexterity, strategy and games playing skills like taking turns. With over 1,000 review on amazon, this game has a 5 star rating. The game board is six feet long. Players look for objects on the board directed by the cards they draw. You work together to try to make it to Picnic Island before Pig Will and Pig Won’t eat all the food. There are hundreds of items to find so it’s a lot of fun to explore this board game. 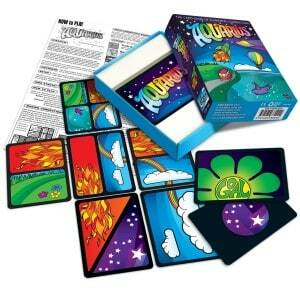 This game combines turn taking, color matching and dexterity. 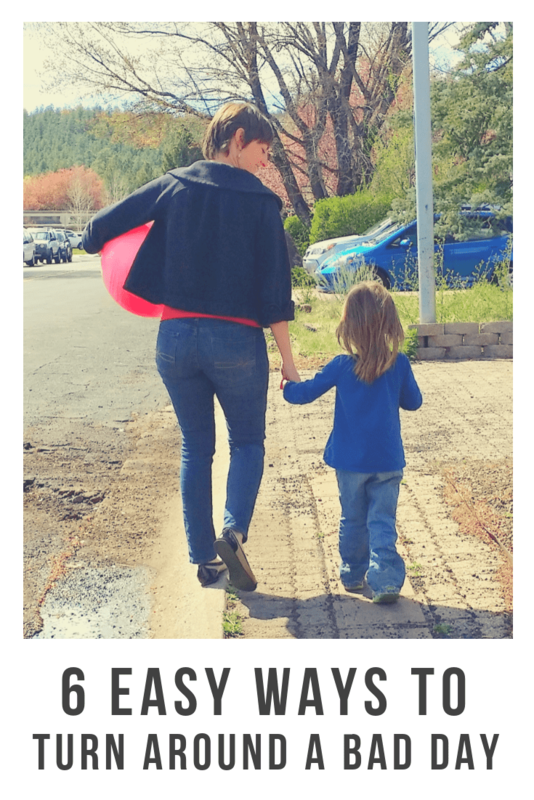 It’s not the most thrilling game for adults, however, it’s enjoyable to play with your preschooler as the length of play is just right, they love it and the tactile feel of the acorns is great. The game is super cute and helps develop hand-eye coordination and basic game play etiquette. Playing board games with preschoolers not only strengthens your relationship connection, game play has cognitive benefits for children as well. When children play board games they learn social skills such as communicating verbally and sharing, the game play can motivate them to increase focus and to practice patience while they wait their turn. Preschoolers love the chance to work on mastering letter and number recognition and counting, hand eye coordination and color recognition. Along with these benefits, playing games together gives children a comforting space to learn how to play within the rules and boundaries of the game. At 4 years old, much of life is hard to predict and not within your control – board games give a sense of empowerment as prechoolers begin understanding how the game works. Preschoolers are beginning to have more and more fine motor skills, their imaginations are blossoming and they really begin to understand how to play with others. This makes the preschool stage and ideal time for board games. 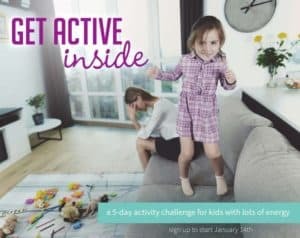 When shopping for board games for your 4 year old, look for games that play to their strengths such as imagination or big movements like hopping; or help them build up new skills such as color, letter or number recognition, fine motor skills like pinching and picking up small objects, or social skills like taking turns. Many of these are board games that have stood the test of time in our family through multiple kids, and some of them continue to be favorites even as the kids get older. 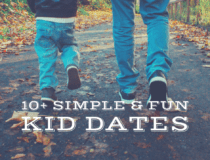 Preschoolers all the way up to teens and grown ups can enjoy playing them – most don’t take long, making them the perfect quick connection activity. This list contains Amazon affiliate links. New this year, this game is now a favorite game in our family for connecting with younger kids. The game play is cooperative. You take turns spinning to see what you’ll have to do in order to be able to put a cupcake on Pete’s Birthday table. Actions you might have to perform include singing a line from a song, naming a favorite food, naming a object that starts with a certain letter sound or charades (simple enough for preschoolers and they include pictures so it’s fine for non-readers.) 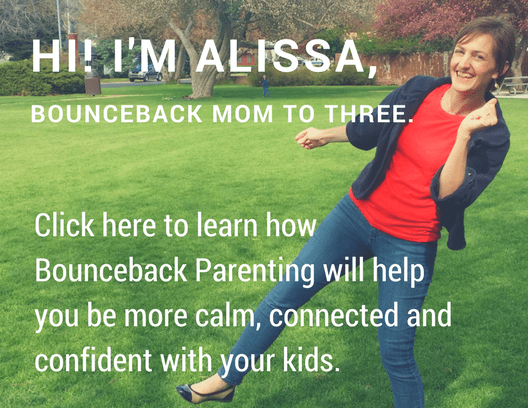 This is a quick game to play and enjoyable for parents and kids. 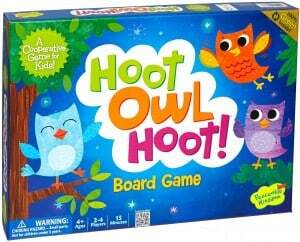 This is one of the most popular games ever from Peaceable Kingdom Games. The goal is for the group to cooperate to get the owls back in the nest before the sun rises. On their turn players must play a sun if they have one (making the sun rise further) otherwise they play one of their color cards (like Candyland). The color lets you move an owl closer to the next. You can play with a different number of owls (up to 6) to make it easier or harder. The game has enough strategy to be fun, and kids get to learn how to work together too. Another parent recently said to me, “You pretty much can’t go wrong with any Peaceable Kingdom games.” and that’s been our experience as well. We also have Seeds for the Birds and Peaceable Kingdom’s Race to the Treasure. 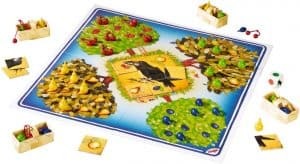 We like Race to the Treasure better than Seeds for the Birds because making the pathway involves many choices and possibility for how the game will unfold – it feels a bit more strategic. 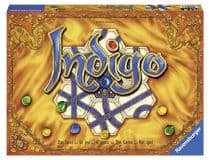 This is a well made game by Ravensburger that reinforces colors and shapes. 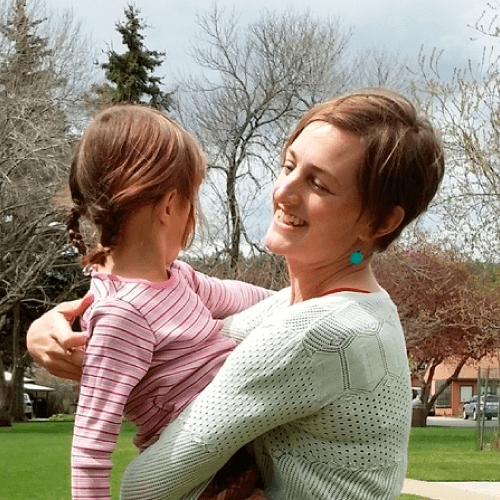 It will appeal most to younger preschoolers – I almost put it on our Toddler Games List, but it probably most suits 3 and 4 year olds. With multiple different ways to play, you can use this game for quite a while. 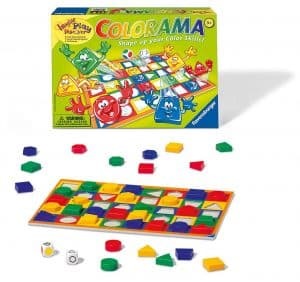 Game play time is about 20 minutes as players roll to find the color and shape, then match a place for it on the board, or take a piece off the board, depending on the rules you’re playing the game with. This is a game that was recommended to me by a grandmother of preschoolers. Her grandkids love the silly foam fish that comes with the game. One the the challenges when choosing board games for 3 year olds and the younger preschool crowd, is that they still have a hard time sitting still. 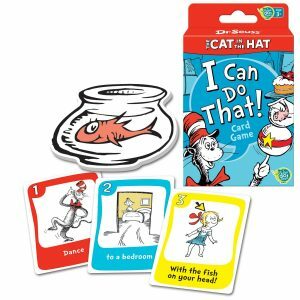 No worries with the Cat in the Hat “I Can Do That!” game. This game involves lots of physical action – perfect for younger kids. Players flip over a selection of three cards which will direct them in performing a challenge. For non-readers, pictures help give clues as to what they cards say promoting early reading skills. With activities that involve things like ‘dancing with the foam fish between your knees’, the combinations can be pretty hilarious. 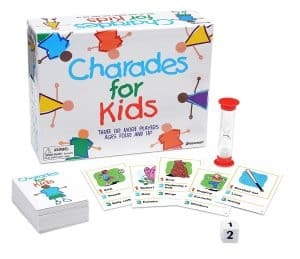 Charades is great for laughs, and this kids version comes with a picture on each card making it possible for pre-readers to play. Non – readers can act out the picture on the card, while players who can read have three different words as option on the cards. This board game taps into 4 year olds’ imaginations and gives them the chance to be active during game play. It’s also just really funny. 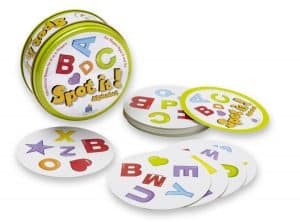 As preschoolers get excited about learning their letters, this ABC version of the ever popular game Spot It is a hit. I mention Spot It in our Favorite Card Games for Kids because there are multiple ways to play and the games go pretty quickly. Each card will have at least one match to every other card. A couple games versions to play include one in which three cards are flipped over out and whoever spots a match first gets to grab them, or having each player flip over a card from their deck and giving away cards to whoever spots a match first (kind of like War where you’re trying to get all the cards first). Great practice for kids learning their letters. 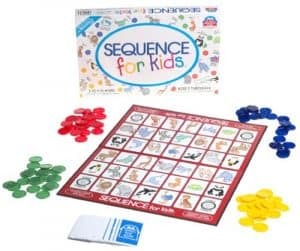 I love finding strategy games that adults can play with kids; that’s how Sequence for Kids is. Kids as young as 3 can learn to play, and you play with multiple ages. To play you put down a card from your hand and place a chip on a corresponding game board space. When you have 4 in a row, it’s a “sequence” and you win. The twist comes in with unicorns and dragons – a unicorn card can be used to place your chip anywhere or a dragon card can be used to remove your opponent’s chip. 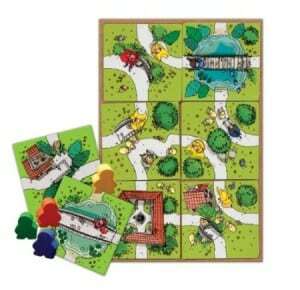 This little bit of strategy makes this game interesting for preschoolers and grown ups alike. You might be surprised to find a “regular” grown up game listed among the best games for 4 year olds, but this is a very colorful card game that requires no reading and it works for preschoolers! It’s played a little bit like dominoes…kind of. You’re trying to get seven of the same pattern together while blocking other people from getting their grouping together. Younger preschoolers may not quite get the point of what they’re doing, but they can still play. This game takes space to spread out, but it’s good for the whole family. We owned this cooperative game when I was a child and my brothers and sister and I loved the beautiful wooden fruit pieces. This is game is easy to play with younger players, and may be a good choice for families with a toddler and preschooler. Players are trying to pick all the fruit from the trees before ravens steal them. The fruits are pears, apples, cherries and plums and the game comes with adorable little baskets for collecting the wooden fruits. 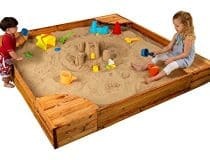 Children who love miniatures and pretend play will love this game. As a fan of the regular version of Carcossonne, I was intrigued to see this game. We do not own it, but reviews are positive. Parents say that it’s a fabulous game because it’s simple enough younger players to play, but has enough choice and challenge that it’s not completely boring for adults. The ideal age range for this game is probably 4-8, but it really works well for a larger range than that. I know they’re not exactly a board game, but when I looked into our game cupboard I saw the floor puzzle all of my kids have enjoyed and had to list this as an idea. Floor puzzles can work well with preschoolers because they take what could be a sitting-activity and give it a bit more motion – you can crawl around on the floor to put together the puzzle. A friend in the UK recommends these games by Orchard Toys as some of the first games her preschoolers have really loved. 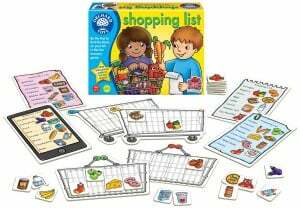 Shopping List is a fun memory game, and Dotty Dinosaur involves color and shape recognition. Your turn! What are your favorite board games for 3 year olds through 5 year olds? Leave ideas in the comments! 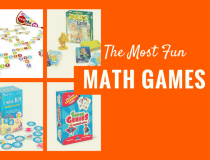 Board Games that Teach Math Skills – fun ways to practice beginning arithmetic and spend time together. I would love some of the games that are available in the US they look a lot of fun. The ones recommended for the UK are fabulous – we had those and many others for our kids from Orchard Toys. 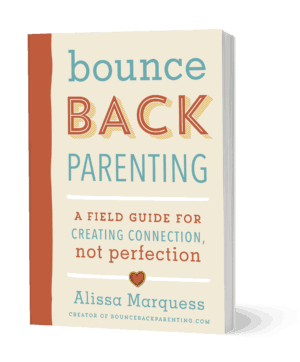 Interaction with parents is really good for kids, and more so when it includes some fun activity like games. Board game keeps kid entertained for quite a while. 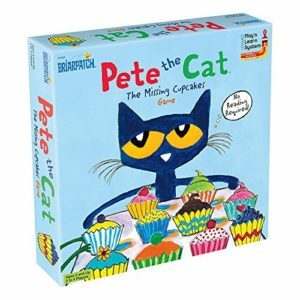 The board games for preschoolers that are listed will become some of our family favorites too! Much better than I could have ever imagined. My son who had some pretty significant delays due to micro-prematurity. He enjoys games and has taken off reading! I am so pleased with your list of board games! Thank you!